The 2014 Maxxis ACU British Motocross Championship draws to a close this weekend with the final round at Foxhill near Swindon. The Buildbase Honda team will compete with its full rider line-up of Brad Anderson, Elliott Banks-Browne and Nez Parker, who will all be aiming to end the eventful season on a high. Anderson’s main goal is to maintain the third place he currently occupies in the championship standings. The double British champion will face a tough battle against Graeme Irwin and Gert Krestinov but he is ready for the fight aboard the Honda CRF450R. Banks-Browne, who sits tenth in the championship, is keen to put his recent arm pump problem behind him and continue his return to the front of the field following his mid-season injuries. Nez Parker meanwhile is fresh from his strong results at the previous round and is aiming to secure top five finishes to improve on his current 17th place. 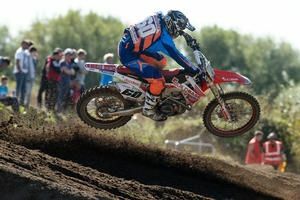 In the MX2 class, Putoline Apico Honda’s Neville Bradshaw and James Harrison will be looking to round off the season – and the team’s final Maxxis British Championship – with some strong results. The Maxxis Championship has been tough for us this season with a number of highs and lows. This weekend we’ll be looking for Brad to secure third in the championship and for both Elliott and Nez to produce some strong results around the very fast Foxhill circuit. My main aim this weekend is to beat Irwin in all three races and secure third place in the championship. Foxhill is a tough track because it can be hard to pass so starts will be important. Hopefully we can finish the season on a high and get on the podium. I'm excited to race Foxhill this weekend. It's a track I really enjoy and seem to have good results at. I've been working hard to get on top of my arm problems and it seems as if I have. I just want to go there this weekend, show what I've been capable of all year and finish the season off strong. This weekend is my last Maxxis with the team so hopefully we can get three strong starts and have three solid results to end the year on a high.